BirdCagePortal.com - Pet Bird Supplies, Parrot Supplies, Cages & Bird Products - GFVCLG - Veggie Crisp Delite - 20 lbs. 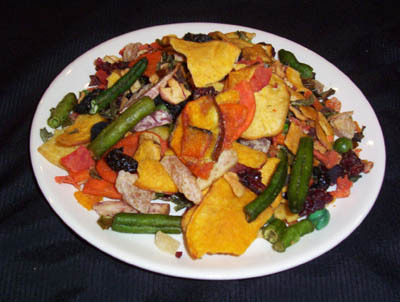 GFVCLG - Veggie Crisp Delite - 20 lbs. Goldenfeast Veggie Crisp Delite - 20 lbs. Ingredients: Sliced & fried sweet potatoes, squash, carrots, green beans, taro, soybean oil, dextrin and salt. Dehydrated sweet potato, dehydrated sweet red bell peppers, dehydrated guava dices, dried papaya dices, dehydrated cranberries, dried mango dices, dehydrated carrots and dried cherries.